During the 9-12th of June BioGaia participated at ESPGHAN, the 47th Annual Meeting of the European Society for Paediatric Gastroenterology, Hepatology and Nutrition, in Jerusalem. This meeting gave the 2300 paediatricians and other pediatric health professionals from all around the world the opportunity to discuss and share their clinical and research field interests, to present original works and network among new and old colleagues. BioGaia was one of the 40 exhibitors, in co-operation with the new business partner for the Israeli market, Pharmabest. During this congress BioGaia also hosted a successful satellite symposium presenting the latest research on Lactobacillus reuteri Protectis in child health. BioGaia had the privilege to host a morning satellite symposium on Tuesday the 10th. Under the main headline “New perspectives on probiotics in paediatric health” the symposium enticed more than 200 delegates. It was chaired by Professor Zvi Weizman (Ben-Gurion University, Israel). The three other prominent speakers were Professor Hania Szajewska (University of Warsaw, Poland), Dr. Flavia Indrio (University of Bari, Italy) and Professor Pedro Gutierrez-Castrellon (Dr. Manuel Gea Gonzalez Hospital and LaSalle University, Mexico). Dr Szajewska presented the clinical evidence for L. reuteri Protectis in infantile colic including a new metanalaysis with pooled results for crying time from three studies (shown below). 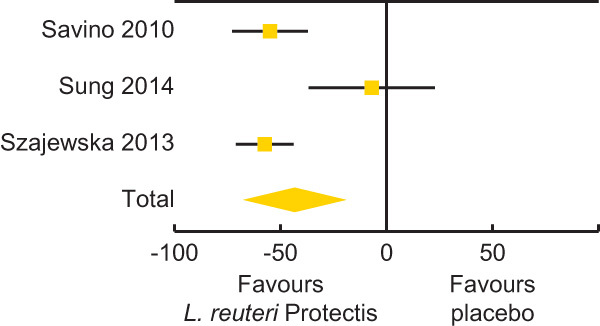 The analysis shows that L. reuteri Protectis is favourable in terms of reduction in crying time compared to placebo, by 43 minutes. Moreover she presented that L. reuteri Protectis now is on ESPGHAN’s positive recommendation list for management of acute gastroenteritis in children. Dr Indrio presented the gut brain-axes model and the role the microbiota has in modulating brain development and behaviour. In this context she also presented her recent findings on the beneficial effects of L. reuteri Protectis in both treating and preventing infantile colic, constipation and regurgitation. Finally, Professor Gutiérrez presented his new data on L. reuteri Protectis in day school children, and the clinically significant preventive effect on diarrhoea, respiratory tract infections and use of antibiotics. This year’s scientific program was covering topics including everything from IBD and functional GI disorders to systematic reviews, how to run multicentre clinical trials and EU regulations for paediatric drugs, making sure there was something for everyone. Some highlights are summarized below. Many researchers discussed the microbiota and its function; Allessio Fasano (Harvard Medical School, USA) was talking about how genes, nutrition and the gut mucosa function interact together. Flavia Indrio (University of Bari, Italy) covered the gut-brain mechanism. Olivier Goulet (University Paris, France) was discussing the role of the DNA of commensal bacteria and explained that humans have a relatively small genome compared to other organisms and the reason we can survive with this small genome is the genes in our microbiota, our commensal bacteria. Vitamin D was discussed during one symposia, and Daniel Roth from (University of Toronto, Canada) showed that vitamin D status in pregnant women are lower than expected in South East Asia and Middle East even though these women are working outdoors and exposed to sunlight. In the same session it was also shown in a study from Bangladesh that supplementation of vitamin D during pregnancy and infancy gave significant effect on low birth weight, birth length and head circumference. New data was presented on functional abdominal pain by Zvi Weizman (Ben-Gurion University, Israel) during a Nutrition Trial symposia within the ESPGHAN program. These data (SP-N-0102) showed that L. reuteri DSM 17938 was significantly better at reducing frequency and severity of abdominal pain compared to placebo. The same group of people presented another poster on the same topic (Weizman et al PO-N-0248). This poster presented a systematic literature review on the effects of probiotics in abdominal pain related functional gastrointestinal disorders in childhood where six of 102 initally identified studies were selected. Two of the studies were made on L. reuteri DSM 17938 and both showed pain relief. During the poster session on Thursday 12th, Simone Ceratto (University of Torino, Italy) (PO-N-0316) presented a longitudinal 5 year follow up data on children from the Savino 2007 study on exclusively breastfed infants with colic being treated with L. reuteri DSM 17983 for 21 days. This follow-up aimed at investigating if atopic diseases, asthma or migraine was prevented in children with colic treated withL. reuteri compared to the placebo group. Results in table below, show that the use of L. reuteri DSM 17938 significantly reduced the prevalence of atopic disease at five years of age.